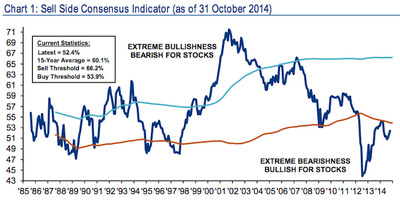 Wall Street strategists are more bearish on stocks than they were at the March 2009 lows. So it’s time to buy. On Friday, the S&P 500 again made a new all-time closing high, but according to Bank of America Merrill Lynch’s Sell Side Indicator, Wall Street is signaling that is still time to buy stocks. Subramanian writes that when the Indicator has been this low or lower, total returns over the next 12 months have been positive 96% of the team, with median returns of 26%. Here’s the latest chart of the Sell Side Indicator.